I saw this in a book shop once. One look at the cover and you know it’s going to be interesting. So I read the back, went “Huh, that sounds kinda cool” and left it like that. Then I got round to reading it. And I think my entire brain exploded. AND HOLY FREAKING WAFFLES THIS BOOK IS AMAZING! Now that’s over, we can start the summary of the awesometacular book. Go! Abortion is illegal. You cannot harm a child until they reach 13, when you can choose to have them ‘unwound’ (basically kill them and use they’re body parts to help other people) which is described as not killing the child exactly, as they live on through other people. Kinda. Unwinding is a common and accepted practice in this society. Connor is chosen to be unwound because he gets into too many fights, Risa isn’t good enough at playing piano in her foster home, and Lev is the 10th child of his family and you have to give away 10% of your possessions to the church. So Lev is a Tithe, one of the children who actually wants to be unwound. And then awesomeness ensues. Pure, amazing, mind-blowing awesomeness. I’m only starting with this because it’s going to be short. I have one Con, I think. Maybe 2. WHY IS THE SEQUEL NOT COMING OUT TOMORROW. WE HAVE TO WAIT UNTIL AUGUST. IT’S KILLING ME. WHY IS THE MOVIE NOT OUT YET. I WANT TO SEE IT SO BADLY. And the characters were all awesome. Lev’s development as a character was really unexpected but really cool to see. He did a 180 turn, but it was an understandable development in his personality. And Roland. Man, that one scene where Roland shows his vulnerable side (you’ll know the part I’m talking about if you’ve read the book. Because that is also the most disturbing part of the book. Urgh, the brain thing. Urgh. I think I actually shivered when I was reading that.) And Cy-Fy was my favourite character. Definitely. My favourite scene in the whole book is when Cy-Fy asks for forgiveness with the suitcase and the crying and the stolen stuff… I love Cy-Fy. And of course Connor and Risa were awesome. And I really disliked Ariana (I mean, I understand why she did it, and everything, but STILL.THAT… let’s move on before I start using really bad language). The writing style was really cool. It switched between characters really well, and it was third person, but from different perspectives, if that makes any sense. And the end! It wasn’t a cliffhanger like Everlost, but still! And the hand! And Lev! You know, when I was reading the last few pages of the book, I was getting really upset because the book was ending. I was so annoyed that it was ending. And afterwards I tried to read “The Forest of Hands and Teeth” by Carrie Ryan, which is not a bad book. Just, compared to Unwind which I’d just read, it didn’t match up. I found it quite hard to get through after all the pure awesomeness Unwind threw at me page after page. And my favourite line ever. “Nice Socks.” Well played, Connor, well played. Man, this book was a rollercoaster ride of excitement and amazingness. “Roland glares at Connor and Connor glares back. Then he says what he always says at moments like this. Do you even have to ask for a rating? This is one of my favourite books of all time. OF ALL TIME. It might surpass Harry Potter for me, though I don’t know. They’re such different books it’s really too hard to make a comparison. And Harry Potter is connected to my childhood. Every time I reread them I always get all this nostalgia and other gooey stuff. The type of stuff everyone got when they were watching Toy Story 3. 5 shuriken stars. So epic, so amazing, so fantastically awesomely amazing. I really want to just sit here and gush over how amazing it was. This is what convinced me to read Everlost by Neal Shusterman, and what has made him one of my favourite authors. Except the end killed me. With Allie and Mikey and… URGH I can’t say though because this has to be a spoiler free review. But let’s just stress this. THIS BOOK WAS AMAZING AMAZING AMAZING AMAZING AMAZING. Let’s put it this way. As soon as I finished Everwild, I started looking for an Everfound excerpt online. I read that, and then I freaked out. Because I wanted to read it so badly. And even though I could probably borrow it off a friend the next day and I needed to do work and so on, I freaked out. In the end I bought it on my Kindle even though I hate spending money when there’s a library. BUT I HAD TO READ IT. I HAD TO! So, I didn’t get any work done, but I did finish an awesome book, so that has to count for something. How do a summarise this without spoiling the last two books? I didn’t mind him. But I think he could have been made a bit more flawed. Then I would have liked him more. Everything else. Absolutely everything else. Everything was just SO AWESOME. I don’t know how else to put it. This book was like a massive Epic Meal Time style bacon burger, covered in awesomesauce and cheese, with a glass of cherry coke (cherry coke makes everything better). And then the ending came and it was oreo ice cream, except there weren’t enough oreos. (This is just because I was upset about Allie and Mikey. I understand why and it was a good ending and stuff, BUT WHY ALLIE AND MIKEY. I LOVE THEM SO MUCH.) Characters (except Jix, who was still really cool, just not my favourite) = awesome. Plot = awesome. Writing style = awesome. Dialogue = awesome. Anything else = awesome. I love how Neal Shusterman makes Everlost so big and so vast, and he really takes all the potential of the idea. I love how he incorporates such interesting ideas. Nothing is completely random. Skinjackers have their powers for a reason, so do rippers, and Mary and Mikey, and the Scar wraith idea was so cool, messing with the idea of phantom limbs and being halfway, stuck in between two worlds. I love how he fills it all up to it’s full potential. Especially when you think about how dangerous being a skinjacker is. They can possess people. POSSESS PEOPLE. In Everwild they covered it, especially with Jill’s business and PSYCHO MARY, but this really shows Mary’s power. Everfound really shows how powerful and scary being a skinjacker is. Neal Shusterman is so awesome. God, if you’ve read my Everwild review you’ll know what I’m going to say. MAN. SHE IS MESSED UP. I was really happy about her own ending, I was worried that Nick and her and all the history and stuff (sorry if that’s a spoiler, I’m trying to make it as vague as possible) would make it really annoying, but the ending was perfect for her. Perfect. Still, she is so messed up. I really don’t know what else to say. I won’t ruin it for you, but MILOS. I thought he was a creep, I still think he is a creep, but if you’ve read Everfound you’ll know which bit I’m talking about. Maybe he’s not creepier than Keenan from Wicked Lovely, but he’s damn sure close. MILOS. God, I absolutely hated Mary for doing that. MILOS MILOS MILOS. I even started to like him at that point. Did anyone see that coming? Because I definitely did not. That was just so… Urgh. MILOS. So, do i recommend the book? OF COURSE I DO! WHAT ARE YOU? INSANE?!?!?!? IT’S AMAZING AMAZING AMAZING AMAZING AMAZING. Though I would expect no less of Neal Shusterman. He is definitely one of my favourite YA fiction authors right now. I need to get my hands on more of his books. 5 shuriken stars. Definitely. Those are the words that kept coming to mind while I was reading this book. If you haven’t read it, then you’ll know soon. 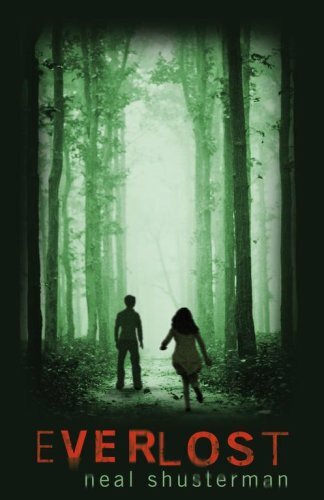 Everwild is the second book in the skinjacker trilogy (Everlost, Everwild, Everfound), and it definitely holds up the amazingness of the first book. To be honest, it surpasses the first book. I enjoyed this one a lot more. Maybe because it’s darker, more intriguing, there are a lot more storylines happening between different characters, and altogether it’s awesome. It really is. If you haven’t read these books, then read them! What’s wrong with you? Go read all of them now! Now I can’t really summarise this book without ruining the last one, so here’s the only way I can really do it. Urgh, Mary! NICK!!!! Mikey and Allie? MILOS YOU CREEP! ZIN! NO THE DOG!!!! MARY YOU CRAZY PSYCHO WITCH! That’s pretty much how the story goes. Seriously, that’s my only Con. Now I can’t wait to read the next book, but I have too much work.Damn you, Neal Shusterman for making me skip my homework to read your amazing books. Why do you have to write such awesome stories? All the twists were amazing. Especially the one involving Allie and all the skinjackers. And then everything with Mary. Geez, I was like :O throughout a lot of this book. I love the direction Neal Shusterman took this book, how it was so much darker and all the ethical problems with skinjacking and ripping and so on and so on. It was all just so amazing. I never wanted to put the book down. My favourite character is Zin. She was awesome. She reminded me of Deryn from the Leviathan Series – Scott Westerfeld. MAybe it was because they had similar circumstances, but she had the same basic personality as Deryn. And I love Deryn, so of course I would love Zin. Milos, the creepiest afterlight EVER, was so annoying. Creepy dude. Urgh. Of course Allie and Nick and Mikey and so on were all awesome. And then we get to the most stand-out character in the book. I feel like she deserves her own little section. She is so messed up. I don’t even know where to start with her. I won’t mention why she is messed up, for all you readers out there who haven’t read this book. But all of you that have: “SHE IS FREAKING PSYCHOPATHIC”. Every time she worked out what was going on, did her reaction take you by surprise? Because every time I waited for her to lose it and she didn’t. I was sitting there going “WTH?? ?” :O And slowly, as the book progressed, she turned more and more psycho until I knew what was going to happen at the end. I saw that ending coming from halfway through the book when Nick revealed his plan to Zin. The reason this took me so by surprise is that Mary was always portrayed as a loving, caring character so I presumed she would be like Mary from the Gone Series – Michael Grant. But she definitely developed as a character. Definitely. This also confirms my belief that Nick should not be in love with her. I like Nick, I think Nick’s cool (apart from the thing with the dog. Not cool. I understand why he did it and stuff but I loved that dog. And I love Zin.) and Mary’s completely cuckoo so he really needs to find another girl. There were many times in the book where I wanted to physically punch Mary. I had to put the book down and calm myself down before I continued reading so I wouldn’t get so agitated with her. Neal Shusterman, how do you get me feeling these violent thoughts about characters that aren’t real? How is this possible? And the ending. The ENDING! That was one hell of an ending. I knew it was coming. I really did. But to end there. Right there. Now that’s just cruel. It’s-Rick-Riordan-and-the Son-of-Neptune-ending type of not cool. God. I have to find out what happens. I NEED to find out what happens. Do you even have to ask how many stars I’ll give it? 5 shuriken stars, easily. Guys, you have to read this! 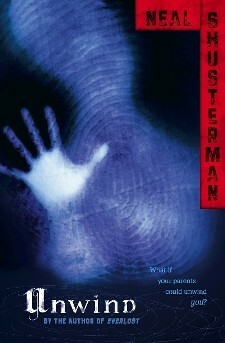 I love Neal Shusterman’s books, I really do. I’ve only read Unwind, Bruiser and Everwild so far, but I love all of them. He’s just such an amazing author. And this book is definitely no exception. It’s the first book in the skinjacker trilogy (Everlost, Everwild, Everfound). And let me just get this out there. THIS BOOK IS AMAZING. 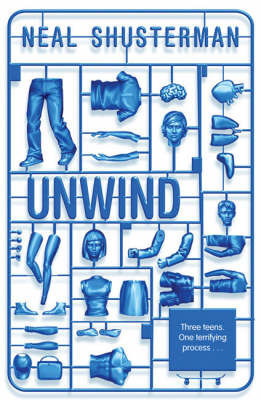 I wouldn’t say that it’s as good as Unwind, just because Unwind was one of those mind-blowing books where you get so sad that it’s ending that you don’t want to keep reading, but you have to. And then it ends and you’re left with that empty feeling inside of you, that only a sequel will fill. But that’s for a different review. Ok. Everlost. This is basically how I sum it up to people who ask: “It’s a book about dead children.” But that’s not a very happy way of putting it, so let’s retry. Nick and Allie are both in the same car accident, and they don’t make it. But instead of going into the light, they end up in Everlost, a kind of strange afterlife for children. Except it’s not really, because they’re caught in between life and death, kind of like purgatory. And this is the setting of our awesome book. Because, yes, it’s totally awesome. There are twists and turns, and it’s just all so awesome. This is probably the tiniest con I have with the book. I keep imagining Lief as Lev from Unwind. It just seemed a bit similar to me, both small boys who seem extremely strange. But they’re development was entirely different towards the end of the book. I won’t explain it to not ruin it, but if you’ve read both, you’ll know what I’m talking about. It’s just that every time I tried to picture Lief I kept thinking of Lev. Maybe it’s because their names are so similar. This is also really a non-existent con. Just something that surprised me slightly. The love between Nick and Mary. They both kept saying how they were head-over-heels in love with each other, even though there wasn’t much in the book to show this, apart from Nick thought Mary was pretty and Mary said that Nick made her feel different. I thought it was more of a crush, but apparently it really was love. It wasn’t bad at all, I just didn’t expect it. The only reason I have a problem with it is probably because I love Nick but I really hate Mary. Now, both those cons were basically nothing. I was just being picky because there was nothing else bad to say about it. Now let’s get onto the Pros. The characters were awesome. Allie, Nick and Lief were all great characters. I even liked the McGill. Though I did hate Mary. I hated Mary so much, even though she wasn’t necessarily an evil character. She was just so snotty, stubborn and believed everything she said was right. And I did not like Speedo either (yes, there’s a kid named Speedo in it). He was really annoying, but in a good way. Because I’m pretty sure Neal Shusterman wanted us to hate the characters, and I did. I understood that they had good qualities, that they weren’t 2 dimensional, but I also knew I hated them. Which I think is great. The author really did do his job well. I loved that there were loads of different weird powers in Everlost. Like skinjacking. That could be abused in so many ways, it scares me. Oh, and the Haunter. Creepy dude. Geez, that ending was amazing. And horrible at the same time. It was a cliffhanger, but such a good one at the same time. But it didn’t feel like the book didn’t resolve itself as well. I thought it was a great way to end a book, because it left it so open that when the reader’s done with it, they can’t help but keep thinking about all the different ways the story could go. It was a brilliant ending, but also a very frustrating one. “What are you talking about?” said Lief. The whole book was just amazing. Amazing amazing amazing. 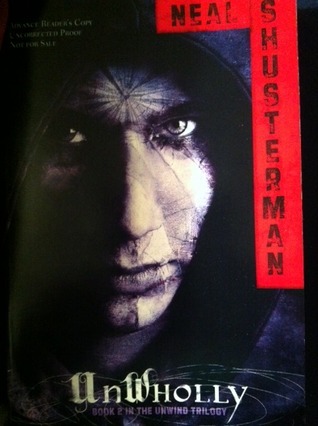 I wouldn’t expect any less from Neal Shusterman. So, 5 shuriken stars, definitely.